In the Western Premier League on Saturday, Stafforce Recruitment Dumfries lost their away match at third placed Ferguslie by 38 runs. Batting first the home side scored 215 for 9 with Ferguslie’s Zimbabwean professional, Dabengwa, the top scorer with 81. Niall Alexander took three wickets, and Chris Bellwood and Drew Dawson each took two, but the Ryedale Remedials Man of the Match for Dumfries was Stuart Alexander for his probing opening spell which was rewarded with just one wicket. In the Dumfries reply, opener Drew Dawson scored 30 and a good sixth wicket partnership between Chris McBride (28) and Stuart Corbett-Byers (30) took Dumfries to 146 for 5. However both were dismissed soon afterwards and Dumfries then fell short with a final tally of 177. In the Western Premier Reserve league, Nunholm had their opportunities against Ferguslie 2nds, Meikleriggs, but lost by 45 runs. 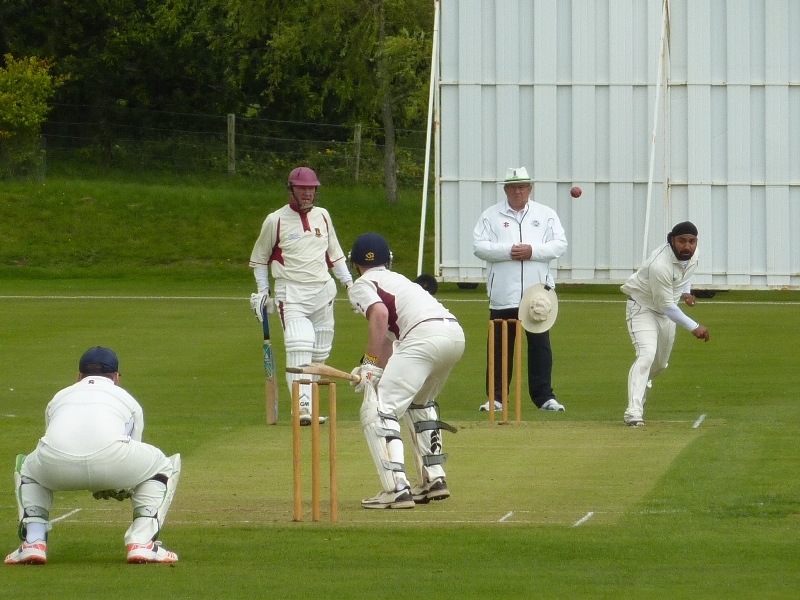 A crucial last wicket partnership took the visitors from 101 for 9 up to 150 all out. The FM Associates Nunholm Man of the Match, Gurupal Singh, and Jerry Goodin both took three wickets and Chris McCutcheon and Aidan Collingwood took two each. Then, despite an innings of 32 from opener Patrick Corkery, and twenties from Goodin (22) and McCutcheon (20 not out) the home side were all out for 105 with 12 overs still remaining. Junior Cricket: Dumfries juniors won another last over finish against Galloway U12s by just three runs at Nunholm last week and an U17 side also competed well to win their match at Moffat by 39 runs. In the Western Premier next Saturday, mid-table Stafforce Dumfries play at home against Drumpellier who sit two places below them in the league, and Nunholm play away at Langloan, Drumpellier 2nds, in the Premier Reserve League. On Sunday, Dumfries compete at the postponed Murgitroyd Scottish Twenty20 Finals day in Glasgow where they take on Poloc, on their home turf, in the morning semi-final.